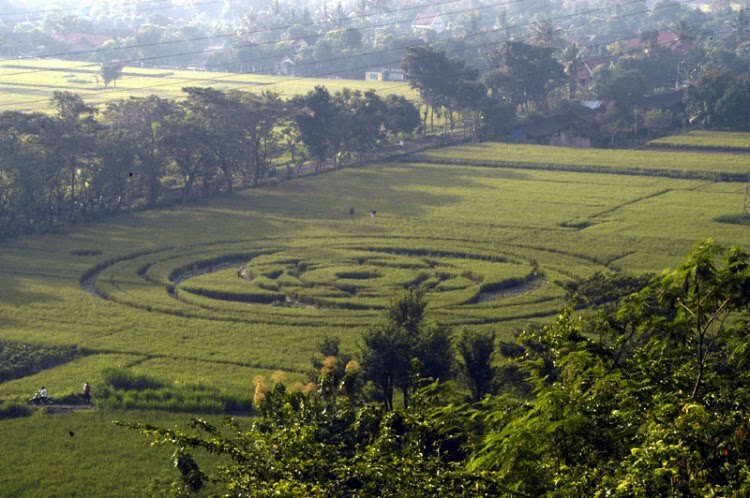 For the first time in our reported history of the Crop Circle phenomena, a beautiful crop circle formation (60 by 70 meters) appeared in a rice field in the Rejosari village, Jogotirto, Berbah sub-district, Sleman district, Yogyakarta province, Indonesia on January 23rd 2011. 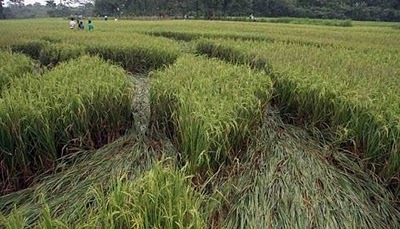 "According to several local residents, they saw a tornado on Saturday evening," said Ngadiran, one of the six farmers who own the land in Sleman. "On Sunday afternoon, we saw the footprint in our fields." Yudi, a local was the first one to have seen the formation when he was passing by the fields on his way to work at 5:00 am, Sunday morning. "During the night, there was no rainfall... 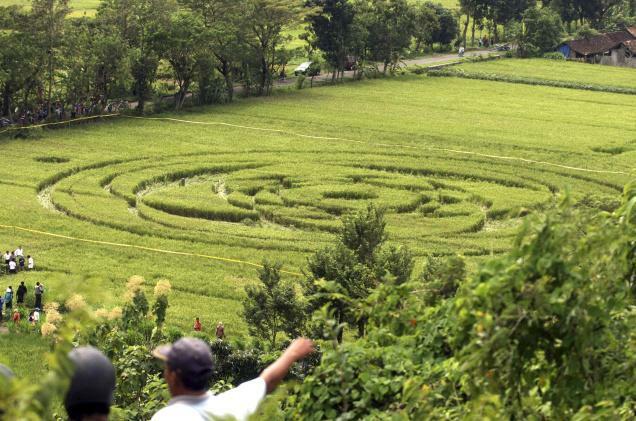 But on Sunday morning, there was this pattern (crop circle) in the middle of the rice field," said Yudi. The crop circle can clearly be seen from the peak of a hill on the northern part of the rice field. The Locals call the hill "Mount Suru", he said. Tens of people who were eager to see the unprecedented phenomenon climbed the slippery hill, including Syamsul Bahri, 37. 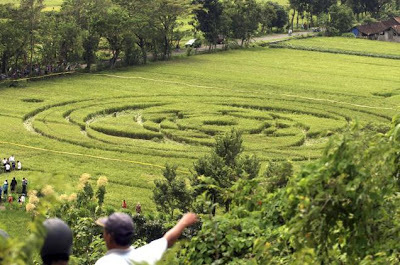 Bahri said the crop circle was a sign of Almighty God’s greatness. 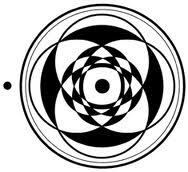 "Whether a UFO has indeed landed here, I don’t know precisely. What is clear is that this is a sign of God’s greatness. Maybe Almighty Allah (God) wants to warn mankind here to take care of His creation, nature," said the resident of Beloran village, Madurejo, Prambanan, Sleman district. There are no aerial images of the formation taken yet, however the few images taken of the formation atop a nearby hill do give a fairly decent idea of what the formation looks like. Some researchers believe the crop circle resembles the 'Muladhara Chakra'. 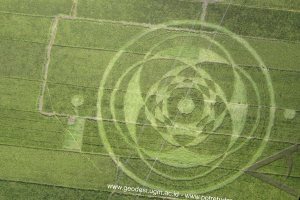 Quite interestingly, it appeared in the YOGyakarta District of Indonesia ! 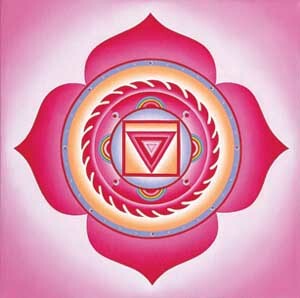 The creators of this formation are probably trying to draw our attention towards "Chakras" and the ancient Indian YOGic tradition ! In the videos below the ground view of the formation shows how neatly the crop has been swirled without any evidence of damage to the crop or smudging of any kind from all that water in the paddy fields, which would've been the case if this was made by some folks with board and rope in the middle of the night ! 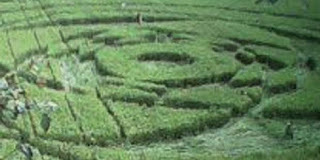 The 777 Aum Crop Circle : Eastfield, Wiltshire ! The Day Before Disclosure : Documentary Film !